Whether you’re new to the labor force, changing careers, or just looking to expand your skills, there might be an apprenticeship that’s right for you. As part of National Apprenticeship Week, Northeast State’s Regional Center for Advanced Manufacturing will host an Apprenticeship Open House Nov. 3 from 8 a.m. – 10 a.m. The event is free and open to the public and business community. Cooper Standard, Domtar, Eastman Chemical Company, and other employers will be on hand to discuss successful Registered Apprenticeship Programs. Registered apprenticeships meet certain guidelines set by the U.S. Department of Labor and people who complete these programs receive a nationally recognized certificate of completion. In addition to employers, RCAM staffers will also provide information and give facility tours. 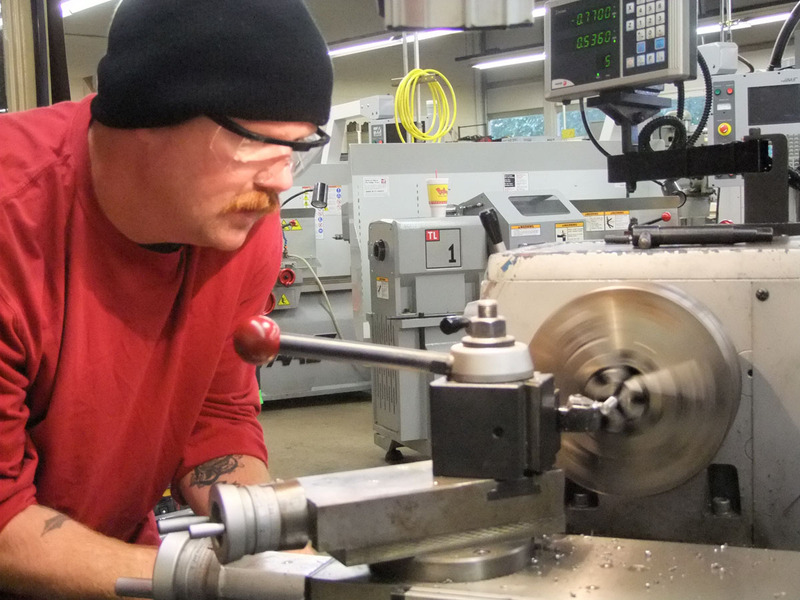 The RCAM currently serves more than 400 individuals enrolled in apprenticeship programs. Training programs offered through the facility include welding, programmable logic controller, process systems, mechanical systems, power transmission, industrial safety, and chemical process operations. An apprenticeship combines on-the-job training and related classroom instruction. According to the U.S. Bureau of Labor Statistics, formal apprenticeship programs connect job seekers who want to learn new skills with employers who want to train workers in jobs that use those skills. An apprenticeship combines on-the-job training and related classroom instruction. Workers earn a paycheck while learning the practical and theoretical aspects of a highly skilled occupation. Most programs last about 3-4 years; however, time may vary depending on the program. At the end of a registered apprenticeship program, apprentices get a nationally recognized certificate of completion as proof of their skills. The benefits are substantial – companies that offer Registered Apprenticeship Programs can diversify their workforce, improve productivity and profitability, standardize training, reduce turnover, receive tax credits and more. For apprentices, the average starting wage is more than $50,000, and workers will earn an average of $300,000 more over their lifetimes than their non-apprentice peers. From careers in healthcare, energy and IT, to manufacturing, transportation and more, Registered Apprenticeship has dramatically impacted the lives, careers and opportunities for millions of workers, and more than 150,000 businesses over the last 75 years. More than 1,100 occupations are approved for apprenticeships through the U.S. Department of Labor’s Office of Apprenticeship. Visit www.doleta.gov/OA/occupations.cfm to get information and view a complete list of occupations. The RCAM is located at 305 W. Main St. in downtown Kingsport. Light refreshments will be served. For more information, contact Susan Harris at 423.354.5275 or shharris@NortheastState.edu. Northeast State is delighted to partner with Bristol Motor Speedway (BMS) to create the BMS Express for visitors to this year’s The Pinnacle Speedway in Lights Powered by TVA winter wonderland. The BMS Express project was unveiled Thursday afternoon at the kickoff announcement for The Pinnacle Speedway in Lights hoiday light show. Now entering its 19th year, BMS gates open for this beloved holiday season spectacular on Nov. 13. Northeast State metal fabrication students and staff are using their skills to give a BMS shuttle bus the look of a steam-powered locomotive. The work involves creating the exterior metal features of a train. Claudia Byrd announced the BMS Express project collaboration between BMS and Northeast State. Once finished, the Express will offer children and families the opportunity to travel through the Speedway in Lights exhibits in a warm, indoor setting. Passengers can also enjoy tasty hot chocolate on those chilly nights. 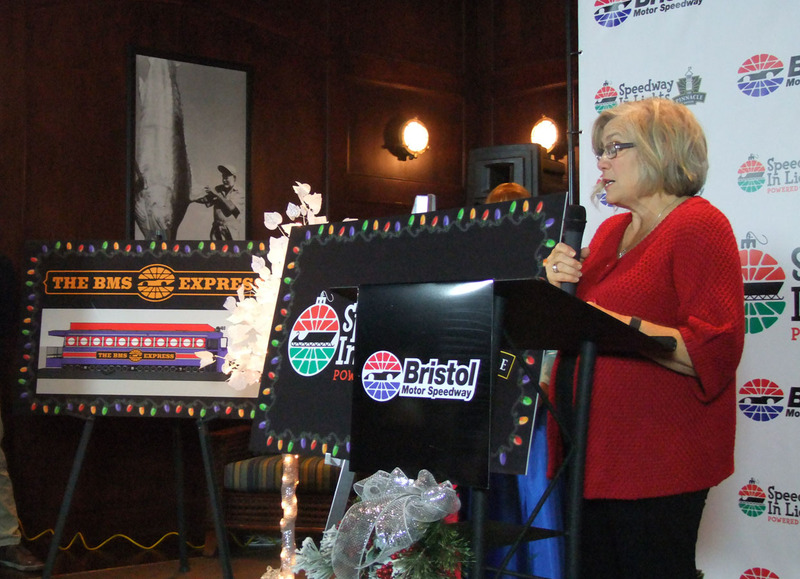 Claudia Byrd, executive director of the Bristol Chapter of Speedway Children’s Charities, said The BMS Express was one of several new features created to entertain visitors to The Pinnacle Speedway in Lights experience this year. The Bristol Chapter of Speedway Children’s Charities has raised more than $9 million for area child-based charities. In 2014, the chapter distributed more than $749,000 to a record 88 regional children’s agencies. Civil War historian Dr. Brian Steel Wills presents a thought-provoking lecture entitled “Flying in the Face of History, The Confederate Flag Controversy” on Thursday, Nov. 5 at 6:00 p.m. in the auditorium of the Kingsport Center for Higher Education. The Civil War conflict was arguably the most important and influential event in the history of the United States. The bitter harvest of the ordeal lingers regarding the banner that is generally referred to as the Confederate flag – one of many different flags used by the Southern armies during the Civil War. The use of the flag and its changing meanings remain controversial to this day. Wills’ lecture touches on the flag’s diverse designs, history, and the cultural resonance of this controversial banner. The event is free and open to the public. Wills is the Director of the Center for the Study of the Civil War Era and Professor of History at Kennesaw State University in Kennesaw, Ga. He previously taught at the University of Virginia’s College at Wise. He is the author of numerous works relating to the American Civil War. The Civil War fundamentally altered the relationship of the states to the federal government, freed four million slaves, and changed the socio-economic development of the nation. Since the end of the American Civil War, private and official use of the Confederacy’s flags, and of flags with derivative designs, has continued under philosophical, political, cultural, and racial controversy in the United States. The event is being co-sponsored by the College’s Office of Professional Development and the Office of Access and Professional Development. You can register for the event by visiting the link: http://apps.northeaststate.edu/registration/FlagControversy/. For more information, contact 423.354.2589. David Ring was clinically dead for the first 18 minutes of his life. Delivered stillborn, Ring’s lifeless body was placed on a table while the attending physician worked feverishly to save his mother’s life. But Ring’s life did not end that day. And his story continued as no one thought it would. David Ring delivering the message. 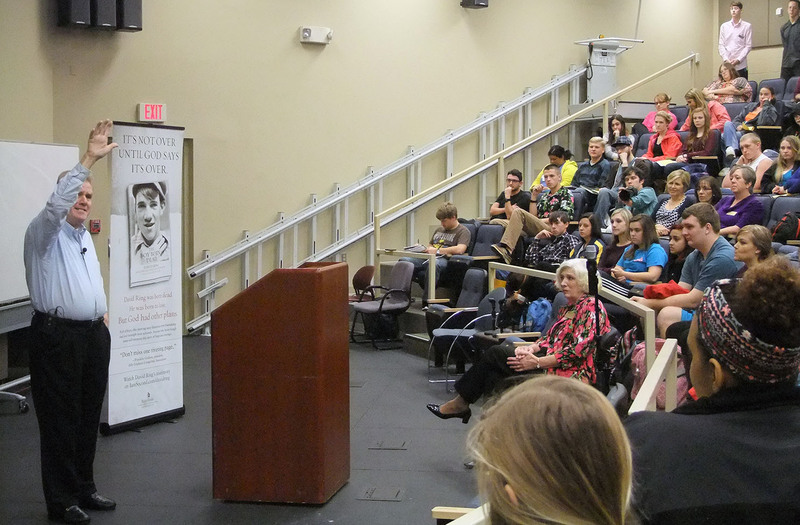 Ring visited Northeast State as keynote speaker for Disability Awareness Week sponsored by the College’s Center for Students with Disabilities. His extraordinary life is chronicled in his recently released book, The Boy Born Dead: A Story of Friendship, Courage, and Triumph. Due to the trauma of his birth, Ring was afflicted with cerebral palsy. Growing up in the small town of Liberty, Missouri, during the late 1960s, he faced many challenges resulting from those 18 minutes of silence. Along with his physical limitations, Ring’s father passed away and his mother died when he was 14. Orphaned and alone, he was moved from home to home, suffering abuse that made him feel unworthy of love and, eventually, unworthy of life. Ring said the difference maker was the day he learned that God loved him. 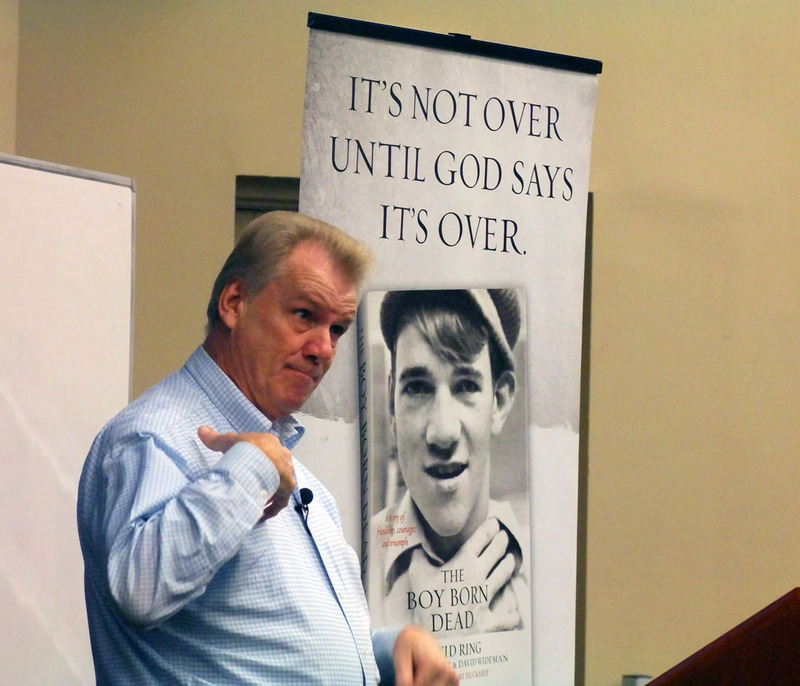 An admittedly angry and rebellious teen, Ring said he took to heart the belief of, “It isn’t over until God says it’s over” and realized God had a purpose for his life. Today, Ring leads an internationally known ministry that encourages hundreds of thousands every year. 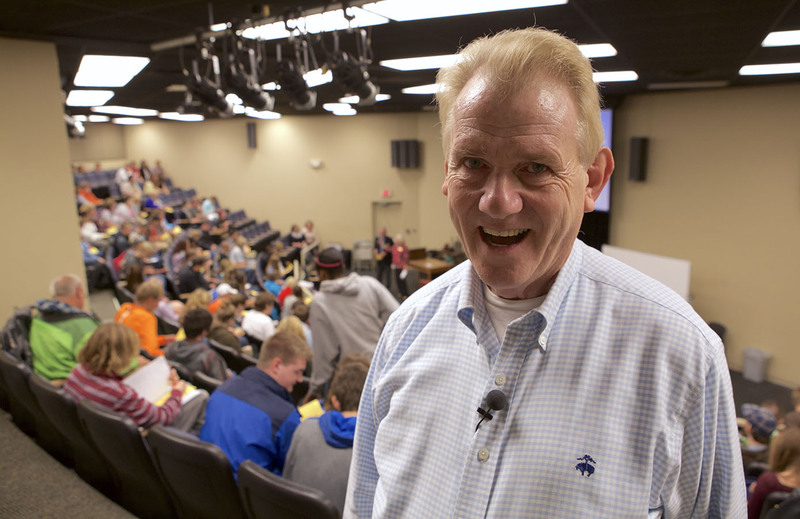 He has racked up more than 7,000 speaking engagements across the United States during the past 42 years. 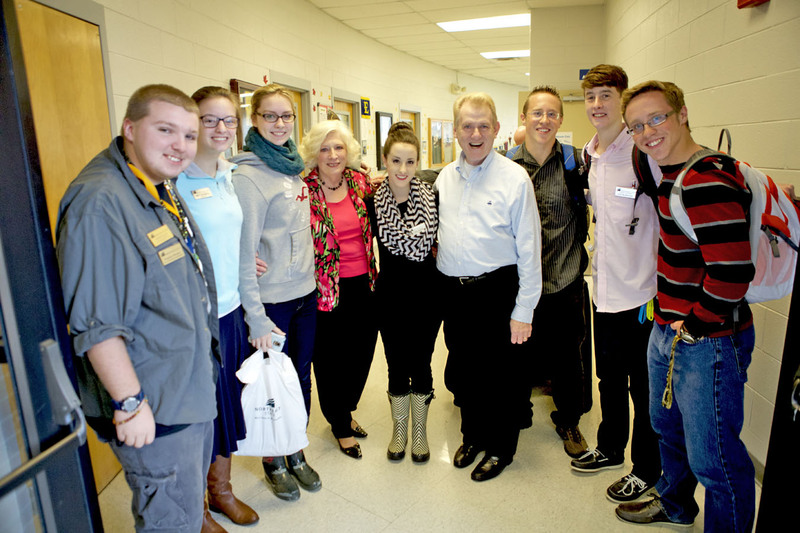 David Ring and friends at Northeast State. The teenage Ring was often told the things he could never achieve. His response to the naysayers was simple: He stopped listening to them. Instead, he got to the business of doing those things. He spent more than 18 years in speech therapy to improve his language. He learned to ride a bike, drive a car, manage his speaking business, marry the love of his life, and deliver his testimony to millions of listeners. The Boy Born Dead is out in paperback and in e-book format through Amazon. He and his wife reside in Nashville and are parents to four children. His book is being made into a movie. David Ring at Northeast State. Northeast State’s Office of Campus Activities has created some fun and engaging intramural programming in recent years that continues to grow in popularity. Beaty and Campus Activities Specialist Tony Kay have created these intramural programs to engage and enrich Northeast State students who enjoy athletics and the fun of healthy competition. The 7-on-7 Flag Football tournament drew eight teams of more than 60 students. 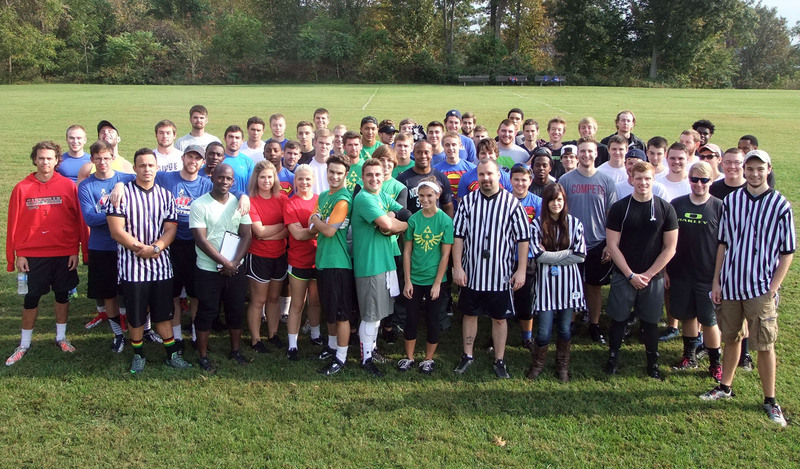 This year’s 7-on-7 Flag Football Tournament was the largest, most participated in intramural event to date. Approximately 65 students participated in the tournament. Given the growth of the tournament the department outlook/expectation for this event moving forward is that it will warrant multiple days to better insure a quality event. 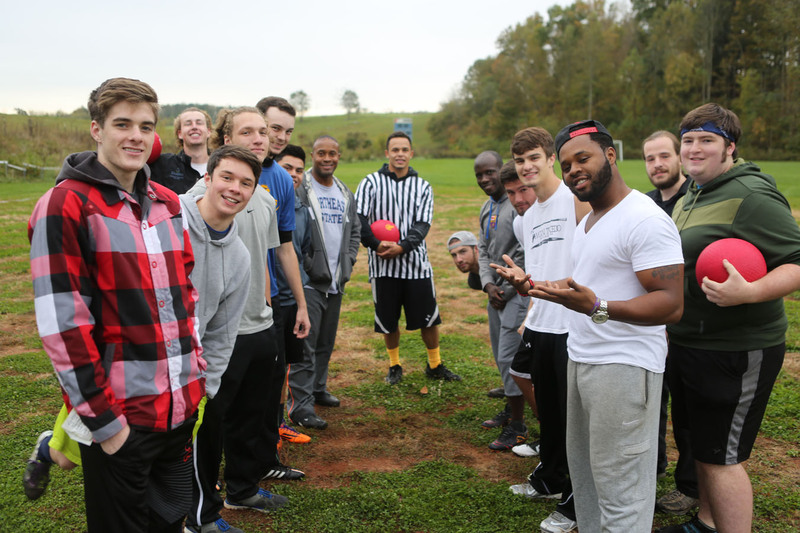 One week after the 7-on-7 football tournament Campus Activities hosted its first Kickball Tournament. The participating students came out with great attitudes and good sportsmanship. Beaty said he expects the event will continue to grow. He also extended Northeast State’s deepest thanks and appreciation to Tri-Cities Christian School for graciously allowing the College to hold these events on their fields. “On behalf of our entire department, we are grateful to our students for their participation and our staff for their support in allowing Campus Activities to ‘take root’ at Northeast State,” said Beaty. Next on the intramural calendar for 2015-16 are basketball and volleyball. The basketball tournament has become an annual intramural activity; while intramural volleyball will be a first at Northeast State. Stay tuned for future events Campus Activities will present in the coming year!